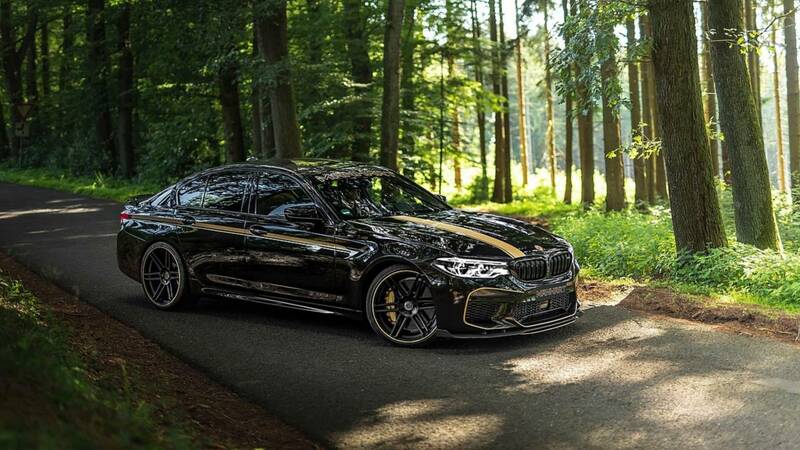 The German tuner Manhart recently unveiled its MH5 700 upgrade suite for the latest M5 that takes the already potent machine to 713 horsepower (723 PS by German standards). Now, Schmee150 has had the opportunity to drive the high-horsepower sedan, including a blast down an unrestricted section of Autobahn. The MH5 700 retains the standard model's biturbo 4.4-liter V8 and eight-speed automatic, but Manhart manages to make tweaks that push the output by 96 hp (72 kW) and 89 pound-feet (120 Newton-meters) over an M5 Competition. The stock sedan reaches 62 miles per hour (100 kilometers per hour) in 3.3 seconds and 124 mph (200 kph) in 10.8 seconds. Manhart's upgrades should make its machine even quicker. Manhart also takes the opportunity to make the M5 look a little meaner. The firm fits new, carbon-fiber pieces for the front fascia, rear diffuser, and exhaust trim. According to Schmee, a carbon fiber hood is currently under development, too. Schmee owns an M5 and says that driving Manhart's is a lot like the standard version – until you really dip your foot onto the accelerator. He says that the MH5 700 gains speed at part throttle the same way that his does at full throttle. Manhart also installs an adaptable KW suspension that lowers the ride height slightly. In the hardest setting, they are a little too firm for him, but a softer mode is just right for use on the street. The other big difference is the sound. From a cold start, the MH5 700 emits a loud bark from the exhaust. Even with the valve closed to quiet it down, the pipes are still fairly loud. The video below offers Manhart's official look at the MH5 700.